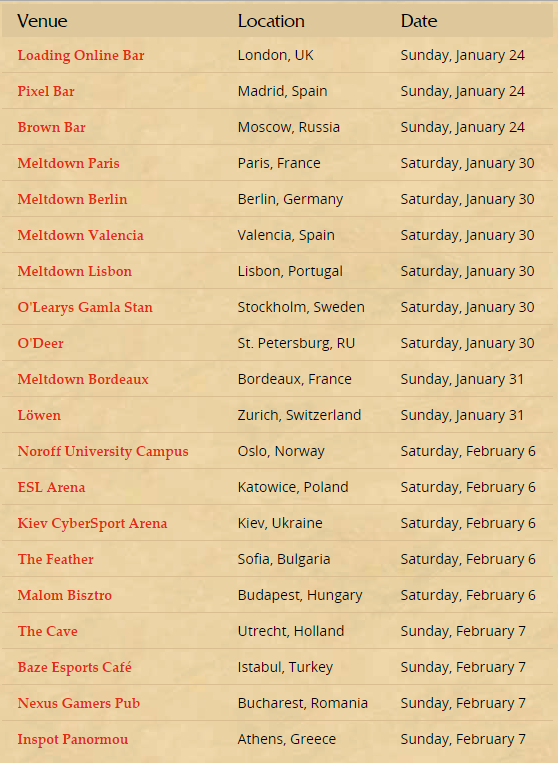 Blizzard have announced the dates and locations for their European Tavern Heroes tournaments. The winners of these events will get direct entry into the 2016 European Winter Preliminaries, without having to earn World Championship points. The Tavern Hero events are designed to get people together to play Hearthstone at physical locations. This has been something Blizzard have pushed from the beginning, and they seem keen to carry on down that route. These events will also mean that the World Championships feel accessible to anyone, and not just those who can perform consistently well in tournaments or on ladder. The full list of events for this season is shown below. Good Luck to anyone from Icy Veins who gives it a go. If you want to let others from here know you're going, or let us know how you got on, feel free to post in the comments section at the bottom of the page.